Pistia requires generous light, but this is mitigated to some degree by being closer to the light source at the surface. Small, ridged leaves form radial rosettes, with hanging roots that may reach 30cm (11.8") or more in length. Roots are white, purple and black in colour. A floating plant. Considered an invasive species where it has been introduced to domestic lakes and streams in states such as Florida. Outdoors, it may form dense mats that prevent light from reaching underwater, choking out native plants and clogging waterways; dense mats prevent adequate CO2 and oxygen exchange at the water's surface, starving fish of oxygen. Care is advised when disposing of cuttings or other plant waste so that it does not propagate to wastewater treatment plants and other bodies of water, especially in tropical or subtropical climates. Because it is regarded as an invasive pest, this plant is illegal to possess or transport in the state of Florida. Propagation occurs both vegetatively by runners and sexually, with seed-producing flowers. In an aquarium, it must be pruned to prevent blocking light needed by plants in the lower water column. The roots provide cover for fish that inhabit the upper water column, and can also be used by bubble-nesting fish such as Gouramis and Bettas. Kuhli loaches may also use these as spawning areas. 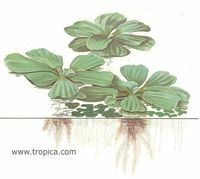 Pistia may also stave off excessive algae growth and algae blooms in aquaria, where it outcompetes algae for nutrients and light. This page was last edited on 22 August 2011, at 12:26.